Now that we know ancient power will be the community day move for Mamoswine, which move do u think we will be getting after those 4 hours of exclusive community day move ?? Ancient Power is much more aligned to the fact that you can have a Mamoswine, and there has always been some sort of connection with the main series of Pokémon games. This is Niantic way of making that connection. If you want a powerful meta-relevant mon with 2nd attack non-STAB Rock Slide for alternative when fighting gyms, you have Machamp. If you want a mon that will top the DPS charts for raids with Rock attacks and Rock Slide, then there's Rampardos. I don't see how the overlap would be anyhow necessary nor beneficial. Its fast moves are expected to be Powder Snow and Mud Slap, while its charge moves are expected to be Avalanche, Bulldoze and Stone Edge. The good news is that its best moveset (Powder Snow + Avalanche) will not be limited to a four-hour window. First of all, Mamoswine w/ Ancient Power was known for over a week now (there wasn't any official Niantic confirm until now, but it was leaked), so nothing is new. Overall, GamePress states that Ancient Power is a terrible move (which it is for PvE), but it has decent coverage in PvP (being a 3-bar move and having coverage against fire types). Aside from that, PS/A is the best and MS/B is the second best. It depends on which one do you need or want. I'll stick with the Stone Edge because it allows me to click for avalanche at the left instead of the right....no thanks. Depends what meta you mean. Raiding you right it's not. PVP absolutely Meta relevant for both the Ultra League and Master League. Can't tell you how many trainers I battled against that used Charizard in Ultra or Moltres/Entei in the master league. Mamoswine is a great option because someone will throw a Rayquaza or Dragonite in the Master league so your covered there and then it's like " oh look a Moltres ANCIENT POWER BIOTCH!" Ancient power is a coverage move for him in PvP, but don't worry, his best ice moves, powder snow and avalanche, will be not exclusive. 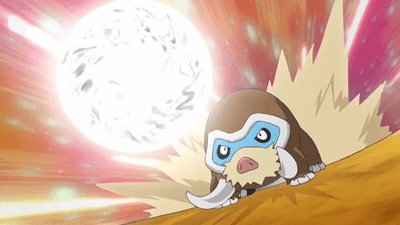 Mamoswine's high atk:low def (as far as I understand PVP rankings) is not favorable for great or ultra league PVP. If you want to use Mamoswine with a slightly cheaper (45 energy vs 55 energy) rock coverage move in master league, then just evolve one Swinub with high level and/or high IV. After your one possible evolve for master league, just evolve your highest level shiny if you want to show off as a gym defender. With all the previous worry about having enough Sinnoh stones, it is nice that we do not actually need to rush to IV check and evolve a full team of Mamoswine during the four hour window. A lot of solid points there.